Corresponding authors. E-mail addresses: yuanjieteng@zjut.edu.cn (Y. Teng), liuwh@zjut.edu.cn(W. Liu). Abstract: A novel electrochemical method for the rapid detection of organophosphorus pesticide residues was realized on a dual-channel screen-printed electrode (DSPE) that was integrated with a portable smartphone-controlled potentiostat. The two carbon working channels of DSPE were first modified by electrodepositing of Prussian blue. The channels were then modified with acetylcholinesterase (AChE) via Nafion. The inhibition ratio of AChE was detected by comparing the electrical current of acetylthiocholine (ATCh) that was catalyzed by the enzyme electrodes with (channel 1) and without (channel 2) organophosphorus pesticide. Inhibition ratios were related with the negative logarithm of the organophosphorus pesticide (trichlorfon, oxamyl, and isocarbophos) concentrations at optimum experimental conditions (pH 6.9 of electrolyte, 0.2 V working potential, 2.5 μL AChE modification amount, and 15 min inhibition time). The linear equations were I%=32.30lgC + 253.3 (R=0.9750) for isocarbophos, I%=35.99lgC + 270.1 (R=0.9668) for chlorpyrifos, and I%=33.70lgC + 250.5 (R=0.9606) for trichlorfon. The detection limits were calculated as 10-7 g/mL. Given that the inhibition ratios were only related with pesticide concentration and not with pesticide species, the proposed electrodes and electrometer can rapidly detect universal organophosphorus pesticides and assess pesticide pollution. Organophosphorus pesticides are the most commonly used pesticide in China since the prohibition of organochlorine pesticides. To date, more than 70% of the pesticides used in China are organophosphates and carbamates . The excessive use of these highly toxic organophosphate pesticides has numerous harmful effects [2-4]. Poisoning from pesticide residues directly threatens human health and survival . Thus, the detection and treatment of organophosphorus pesticide residues have received wide spread attention. Pesticide residues are detected with numerous instrumentbased quantitative and qualitative methods, such as gas chromatography , high-performance liquid chromatography [7, 8], and gas chromatography-mass spectrometry [9, 10]. Although these methods are highly accurate, they are expensive with lengthy and time-consuming pre-treatment processes. Fast and continuous pre-process technologies, such as solid phase extraction [11, 12], microwave extraction [13, 14], and liquid-liquid extraction , have been developed to adapt to market demand. However, these methods are also limited to laboratory experiments and cannot provide real-time analytical results quickly and easily. Some recently developed methods for field analysis use enzyme inhibition [16-18], which is based on the inhibitory and attenuative effects of organophosphophate pesticides on acetylcholinesterase (AChE) activity. The electrochemical method and enzyme-specific color reaction [19, 20] are the two commonly used detection methods that are based on enzyme inhibition. However, the degree of color change usually need to be performed by UV–vis spectrometry, while some existed testing strips identified by eyes usually has high false-positive ratios. The electrochemical method utilizes the difference in current signals to determine the degree of enzyme inhibition and concentration of organophosphophate pesticides. Some papers [21-25] have reported to improve the sensitivity using different modified methods for electrodes. These methods can satisfy the requirement of detection limit and has high sensitivity, however, the complex modification process of electrodes and extraction of organophosphophate pesticides from samples prior to detection are required or the large size of the electrochemical workstation is used which is not conducive for field analysis. Also, these modification and detection processed are hard to be integrated. Screen-printed electrode (SPE) is an electrochemical electrode that is fabricated by thick film-integrated circuit technology  and has the advantages of cheap price, ease of use, and high detection sensitivity . It can be modified with different printing materials, such as ink proportions , metals [29-31], enzymes [32-35], polymers [36-38], or composites [39-41]. Moreover, SPE can be modified via different electrodeposition methods [42, 43]. Prussian blue (PB) is a kind of blue dye with good properties of chemical stability, reversibility and catalytic performance [44, 45]. Also, the costless PB film can be obtained by simple electrodeposition method [46, 47]. In this paper, a novel double-channel SPE (DSPE) modified by PB was designed to simultaneously measure the rates of enzyme catalysis and inhibition to reduce the detection error from two different modification electrodes and shorten the time of measurement. The proposed method realizes the quantitative detection of pesticide residues and shows good detection sensitivity. Also, the limit of detection agreed with the requirements of Chinese standard . Therefore, it can be used for rapid analysis and has potential market applications combined with a portable electrochemical analyzer. The fabrication steps of DSPE were similar with the single channel of screen-printed three electrodes which we have reported  (as shown in Support information). The electrochemical deposition of PB on DSPE was performed via chronoamperometry (CA) in a mixed solution that contained 2 mmol/L K3[Fe(CN)6], 2 mmol/L FeCl3, 0.1 mol/L KCl, and 10 mmol/L HCl at a fixed potential of 0.4 V for 200 s. Then, DSPE was deposited via CV in a mixed solution that contained 2 mmol/L K3[Fe(CN)6], 2 mmol/L FeCl3, 0.1 mol/L KCl, and 10 mmol/L HCl solution at a potential range of -0.5 V to 1 V for 12 cycles at a scan rate of 50 mV/s. The electrode was designated as PB-DSPE. Then, 2.5 μL of 1 mg/mL AChE was dipped on the surface of the electrode and dried in air. Finally, 2.5 μL of 0.05% Nafion solution was dipped on the surface of the electrode, which was dried in air and maintained at 4 ℃ for 24 h. This electrode was designated as Nafion-AChE/PB-DSPE. After that, the samples of cowpea, kalimeris and cabbage were first milled into a paste. 0.5 g of these samples were weighed following by adding 3 mL of methanol/ethyl acetate/acetone (1:2:3, v/v/v). The mixture was fully oscillated under ultrasonic for 10 min. Then, it was transferred to the centrifuge for 10 min at 3000 r/min to obtain the supernatant. At last, an appropriate concentration of pesticide prepared above was deposited on the surface of the working electrode in channel 2. No pesticide was deposited on channel 1. Then, the Nafion-AChE/PB-DSPE was placed in 0.05 mol/L pH 6.9 PBS after inhibition using CA. Electrode signals from channels 1 and 2 were simultaneously measured on a portable smartphone-controlled potentiostat (Xenstat, Ningbo Yuangan Biological Technology Co., Ltd.) or an electrochemical workstation (CS350, Wuhan CorrTest Instruments Co., Ltd.). The schematic diagram of organophosphate pesticides detection by Nafion-AChE/PB-DSPE was showed in Fig. 1. Both channels were deposited AChE. AChE catalyzes the hydrolysis of ATCh, which produces an electroactive thiocholine (TCh) product (Scheme 1, Eq. (1). TCh reduces PBox to PBred via electron exchange (Scheme 1, Eqs. (2) and (3)). A response current is produced when PBred is oxidized on the electrode surface (Scheme 1, Eq. (4). Given that organophosphate pesticides inhibit AChE, as well as decrease catalytic efficiency and the response current, the inhibition ratio via response current reduction (Inhibition rate (%) = (i1-i2)/i1) can be obtained. The morphology of bare SPE and PB-DSPE electrodes were characterized by SEM. Comparing with the bare SPE (as shown in Fig. S1a in Supporting information), the SEM image of the PB-DSPE electrode (as shown in Fig. S1b) showed PB film was deposited on the surface of working electrode with average PB particle size around 5 μm. Also, the PB film was identified by cyclic voltammerty (as shown in Fig. S2 in Supporting information). With the increasing of electrodeposition time, the response current increased successively. And it is almost stable after 12 cycles scan. Nafion-AChE/PB-DSPE was obviously catalyzed by 0.01 mol/L ATCh (black curve) (as shown in Fig. S3 in Supporting information). Therefore, the response currents of the Nafion-AChE/PB-DSPE in a series of PBS solutions (0.05 mol/L, containing 0.5 mmol/L ATCh) with various pH (6.0 to 8.0) were investigated. The maximum value of the response current was found at pH 8.0 (as shown in Fig. S4 in Supporting information). Although the larger response current was obtained at alkaline condition, PB is easily buffered in alkaline conditions and organophosphate pesticides were easily hydrolyzed when the solution pH exceeded 8.0 which caused a relatively large error. Thus, PBS with a pH of 6.9 was used in subsequent experiments. Then, the response currents of the PB-DSPE at various operating voltages (from 0.1 V to 0.7 V) in 0.05 mol/L PBS (pH 6.9) that contained 0.25 mmol/L ATCh were investigated. Current intensity first increased and then decreased as voltage increased from 0.1 V to 0.4 V (as shown in Fig. S5 in Supporting information). Moreover, current intensity increased with voltage when the current exceeded 0.4 V. Therefore, we used 0.2 V as the operating voltage in subsequent experiments because of the interference from high voltage. Furthermore, the response currents of the Nafion-AChE/PBDSPE that were coated with various amounts of AChE (0.5 μL to 2.5 μL) were measured. Measurements were taken in 0.05 mol/L PBS (pH 6.9) that contained 0.25 mmol/L ATCh. Current intensity gradually increased as AChE increased (as shown in Fig. S6 in Supporting information). The maximum value for current intensity was found with 2.5 μL AChE. Thus, subsequent experiments were performed with 2.5 μL AChE load. The experiments on Nafion-AChE/PB-DSPE electrodes that were modified with 2.5 μL AChE or without AChE were conducted at pH 6.9 with 0.2 V as the operating voltage. 10 μL of ATCh solution (0.05 mol/L) was added to 40 mL of PBS (0.05 mol/L). Then, the current response of the electrode to ATCh was measured. Fig. 2 indicates that the electrode without AChE did not have a current response to ATCh (black curve). However, the AChE-modified electrode exhibited a high current response to the ATCh solution (red curve). Thus, the generated successive current response is a specific catalytic effect of AChE on ATCh at optimum conditions. 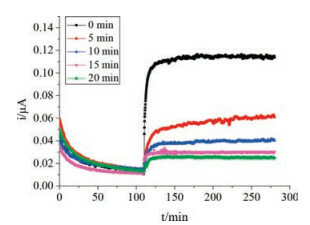 Also, the response currents of Nafion-AChE/PB-DSPE at different immersion time (from 5 min to 20 min) in 0.05 mol/L PBS (pH 6.9) that contained 100 μL 0.05 mmol/L ATCh were investigated by CA. Fig. 3 indicates that current intensity gradually decreased as immersion time increased. This result indicates that the inhibition of AChE by pesticides increased as immersion time increased. However, current response negligibly changed after 15 min (Fig. S7 in Supporting information). Thus, 15 min was selected as the optimal inhibition time. The response currents of Nafion-AChE/PB-DSPE in isocarbophos, chlorpyrifos, and trichlorfon with the concentrations of 1 ×10-7 g/mL to 5 ×10-6 g/mL were investigated using a portable smartphone-controlled potentiostat. Fig. 4 indicates that under optimum conditions, the rate of enzyme inhibition and the negative logarithm of pesticides concentration are linearly related within 1 ×10-7 g/mL to 5 ×10-6 g/mL. The linear regression equation of isocarbophos is I% = 32.30lgC + 253.3 with a correlation coefficient of R = 0.9750. The linear regression equation of chlorpyrifos is I% = 35.99lgC + 270.1 with a correlation coefficient of R = 0.9668. And the linear regression equation of trichlorfon is I% = 33.70lgC + 250.5 with a correlation coefficient of R = 0.9606. These results indicate that the proposed detection method is highly sensitive to pesticides. It also shows that the inhibition curves from different types of pesticides have similar slope. Therefore, the provided detection method can also be applied to evaluate the total amounts of pesticides residues. To investigate the interferences from pigment, the samples with and without pigment (decolorization by active carbon) were detected. The results show that pigment did not affect the test results. Therefore, the real samples were not pre-treated by active carbon. Nafion-AChE/PB-DSPE electrode and portable smartphone-controlled potentiostat were used to test the standard addition recovery methods for isocarbophos from cowpea, chlorpyrifos from kalimeris, and trichlorfon from flowering cabbage to verify the reliability of our method. 1 ×10-7 g/mL, 1 ×10-6 g/mL, and 5 ×10-6 g/mL isocarbophos, chlorpyrifos, and trichlorfon solutions were added into negative samples, respectively. The results are shown in Tables S1–S3 (Supporting information). Isocarbophos recovery ranged from 77.1% to 109.6%. Chlorpyrifos recovery ranged from 84.4% to 117.4%. And trichlorfon recovery ranged from 79.1% to 119.3%. Also, the RSD < 10.6% (n = 3) detected from the portable smartphone-controlled potentiostat are not much worse than the RSD < 5.4% (n = 3) on the same way to be measured on CHI electrochemical workstation. Moreover, these results agreed with Chinese standard requirements , as well as illustrated the high precision and accuracy of our method. The prepared Nafion-AChE/PB-DSPE electrodes were stored in a refrigerator at 4 ℃ in dry and hermetic surroundings. The enzyme electrodes were detected in 0.05 mol/L PBS (pH 6.9) for storage stability experiments. It was found that the response current of these enzyme electrodes only decreased to 84.4% after 7 days. However, they retained 80.8% of its initial current response after a 30-day storage period. So the good stabilities of these NafionAChE/PB-DSPE electrodes are presented. In conclusion, an electrochemical method for the rapid detection of organophosphopate pesticide residue was proposed based on double channel SPE combing with portable electrometer. The prepared Nafion-AChE/PB-DSPE electrodes simultaneously measure current response with and without inhibition. The results showed that under optimal experimental conditions, the rate of enzyme inhibition and negative logarithm of isocarbophos, chlorpyrifos and trichlorfon concentration are linearly related. And different kinds of pesticides have similar slopes. Furthermore, it was verified that the detection limit of this proposed method in real samples can meets the requirements of Chinese standard and shows a good sensitivity and stability. This work is financially supported by the Natural Science Foundation of Zhejiang Province (No. LQ17B050002) and Analysis and Measurement Foundation of Zhejiang Province (No. 2015C37068). Supplementary data associated with this article can be found, in the online version, at https://doi.org/10.1016/j.cclet.2017.11.023. B. Zheng, Q. Li, J. Shao, H. Liu, Guangdong Agric. Sci. 3 (2013) 108-114. D. Chen, Y. Jiao, H. Jia, et al., Int. J. Electrochem. Sci. 10 (2015) 10491-10501. S. Gao, J. You, Y. Wang, R. Zhang, H. Zhang, J. Chromatogr. B 887-888 (2012) 35-42. H.X. Zhang, R.B. Wei, C.Z. Chen, X.L. Tuo, X.G. Wang, Chin. Chem. Lett. 21 (2015) 39-42. Abdel-haleem F.M., M. Saad, M.S. Rizk, Chin. Chem. Lett. 6 (2016) 857-863. B.C. Huayhuas-Chipana, M.V. Foguel, L.M. Gonçalves, M.D.P.T. Sotomayor, Microchem. J. 131 (2016) 92-97. D. Tu, Y. He, Y. Rong, Y. Wang, G. Li, Measure. Sci. Technol. 27 (2016) 1-7.